How to Convert Contacts List from Excel to vCard or VCF File? Are you looking for a solution to convert Excel contacts to VCF? Find both manual and automated solution (Convert Excel Contacts into VCF). Also, learn about how to convert contacts in excel to VCF format. Then, you are landed in the right place as we have come up with a relevant method to perform this task efficiently. As everyone knows, contacts play an important role in professional as well as personal life. Many users want to keep a contact list saved in excel spreadsheet. It will keep all contacts on different platforms very easily. Some cases when users try to copy contacts from Excel to .vcf they may face certain problems. In fact, it is not a simple or easy task to export Excel contacts to vCard. Furthermore, here are mentioned some benefits of converting excel contacts to VCF format. By using vCard file format, a user can easily share information on numerous Digital platforms such as Email Clients, Whatsapp, Messenger, Application, Cloud, Android and iPhone Devices. As these platforms to convert Excel contacts to vCard uses a different format to export contacts. The User can view and read all information in a mentioned platform without using other external software. Henceforth, in the upcoming section, we are going to discuss a manual method to users understand how to convert contacts in Excel to VCF in an efficient and effective way. Then, in the contact Windows select import in the navigation bar. Now select the CSV or Comma Separated Value Field. Now User needs to Map the Attributes of Excel file with Text filed to Convert Excel contacts to VCF properly. Once the mapping of excel field to the text field is completed then, Click on “Finish” button and Again select CSV or Comma Separated Value option. Now user can able to see the imported contacts from the excel file. Now select the contacts, a user needs to convert into VCF format. After selecting, Click on “Export” option and choose“ vCard (folder of .vcf Files)”. Then, browse the location, a user need to save the converted contacts within the system. Click on “Export” option again. 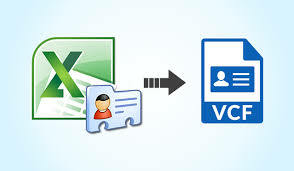 Nowadays, the most common search is how to convert contacts list from Excel to vCard or VCF file. Therefore, in the post, we have discussed a manual way to transfer contacts from Excel to VCF file format. Also, we are suggested a commercial way i.e. Excel to vCard Converter through which one can easily convert Excel contacts list to vCard in the most convenient and reliable way.